Baltimore Car Accident Lawyer | $100,000 Settlement from Travelers Insurance Co.
On July 19, 2018, Partner Bryan J. Chant secured a settlement in the amount of $100,000 from Travelers Insurance Company with respect to a client who sustained a sprain of the neck, back, hip, wrist, and hand. The client also had post-traumatic headaches as a result of the injuries. LeViness, Tolzman & Hamilton P.A. 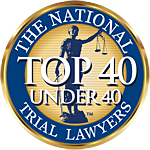 has decades of experience handling soft tissue injury cases as well as catastrophic injury cases. Call us at 410-727-4991 or submit an online inquiry for a free consultation.